We’d love your help. Let us know what’s wrong with this preview of Doughnut by Tom Holt. Things have been going pretty badly for Theo Bernstein. An unfortunate accident at work has lost him his job (and his work involved a Very Very Large Hadron Collider, so he's unlikely to get it back). His wif The doughnut is a thing of beauty. To ask other readers questions about Doughnut, please sign up. "So what's it like?" asked Not. "That book," said Not. "The one Noella gave you." "Terrible," said Manny after a pause. "Absolutely dreadful. Worst thing I've seen since Harry Quebert." "So that's why you've been reading it all day?" said Not, as her eyebrows did an impression of two rock-climbers starting a rather tricky ascent. "Yes," said Manny, without looking up. "It's just not funny. He keeps putting in all these contrived metaphors that are supposed to be am "So what's it like?" asked Not. "Yes," said Manny, without looking up. "It's just not funny. He keeps putting in all these contrived metaphors that are supposed to be amusing, but they aren't." The mountaineers, who had been stuck on an overhang, got out their pitons and edged onwards. "So I suppose you'll be coming to bed then?" said Not's mouth, quite a bit further down her face. "Oh," said Manny vaguely, "I think I might as well finish it. I only have another sixty pages to go." The climbers, surprised by the sudden progress they'd made, wondered if they might be able to reach the top after all. Manny glanced up for a moment and stopped, surprised. "You look kind of weird," he said. "Is something wrong?" "Don't worry," said Not. "I didn't mean to interrupt you." I was looking forward to this one, having heard a lot of good things about Tom Holt's books, and I tried, 100 plus pages of tried, but just couldn't go on. Doughnut is the first book I have bailed on in memory, I tend to stick with them and often a book has redeemed itself after a bad start and I've been grateful that I had patience, more occasionally I regret my dogged determination. Usually though there is something to keep me clinging on, whereas with Doughnut there was nothing; nothing in th I was looking forward to this one, having heard a lot of good things about Tom Holt's books, and I tried, 100 plus pages of tried, but just couldn't go on. Doughnut is the first book I have bailed on in memory, I tend to stick with them and often a book has redeemed itself after a bad start and I've been grateful that I had patience, more occasionally I regret my dogged determination. Usually though there is something to keep me clinging on, whereas with Doughnut there was nothing; nothing in the writing, not an interesting character, no intrigue, and most definitely not the humour. When Holt describes a guilty shrug as resembling a giant centipede pretending to be a human, I knew things weren't going to get better for me. I mean, I do get the image, it's just not funny. I felt in the company of a boorish, drunken, spliff smoking student union intellectual wittering on in a world of his own with a bunch of friends pretending to hang on his every word. I might hang around long enough to be respectful but then I'd take my leave; let's be honest, he won't notice I'm gone, and so it is with The Doughnut, life is just too short. Strange, English, offbeat. Kinda Douglas Adams (who is better at wry), kinda Jasper Fforde (who plays it straighter, if you can believe it), and not quite Monty Python (who are way sillier), but you can see them from here. Your stomach will not hurt from laughing; you will not marvel at the literary cleverness of it all, and you will not revel in the absurdity of life. You will, however, chuckle often and enjoy bending your head around the Doughnut multiverse. I blame this book for the unreasonable amount of doughnuts brought into the Wells/Tomlinson house over the last couple of weeks. Fun, yet ludicrous, SF farce. I think it's one of those "if this is the kind of thing you like" books. Which I did. Started weak and went downhill from there. Aaahhh, I love Tom Holt and I really wanted to like this book :( Honestly, it gave me a really really hard time and took more than a couple of weeks to finish it. I think I’m partially responsible for not enjoying this book because I opted for the audio and the random incidents in the scenes were harder to connect. Anyhow, I’m glad this is over. It took a delayed flight to finish this book since I wasn’t interested in carrying on. In some ways, I enjoyed the dry humour. I just feel books of this Aaahhh, I love Tom Holt and I really wanted to like this book :( Honestly, it gave me a really really hard time and took more than a couple of weeks to finish it. After Theo receives an apple, a seemingly empty bottle and a small pink powder compact as part Theo Bernstein accidentally put a decimal point one place to the left instead of the right and, thusly, caused the Very Very Large Hadron Collider to explode, thereby disintegrating an entire Alp and becoming one of the most hated men alive. Coincidentally, Shliemann Brothers, the company that held all his investments, went bust at just about the same time, so, well, things aren’t going great for Theo. Funny, totally weird, at times unintelligible. Tom Holt is fun to read. Nothing to serious and certainly not great literature, but full of laughs, bad puns. I'm a big fan of K.J. Parker, so I was stoked to listen to this book. For those unaware, Tom Holt is K.J. Parker, with the difference being that Parker writes fantasy intrigue novels, and Holt writes ... modern-day satirical science fiction? Is that accurate? Doughnut is about Theo Bernstein, a down-on-his-luck ex-physicist with one arm that's there, but invisible, trying to get his life back together after being responsible for blowing up the Very, Very Large Hadron Collider. Turned down for a j I'm a big fan of K.J. Parker, so I was stoked to listen to this book. For those unaware, Tom Holt is K.J. Parker, with the difference being that Parker writes fantasy intrigue novels, and Holt writes ... modern-day satirical science fiction? Is that accurate? Doughnut is about Theo Bernstein, a down-on-his-luck ex-physicist with one arm that's there, but invisible, trying to get his life back together after being responsible for blowing up the Very, Very Large Hadron Collider. Turned down for a job flipping burgers, he takes a job at a slaughterhouse, shoveling guts into a drain. While there, he receives a letter informing him that his old faculty adviser has left him some money and items in his will. From there, he discovers a new world -- literally. It exists someplace alongside our own. 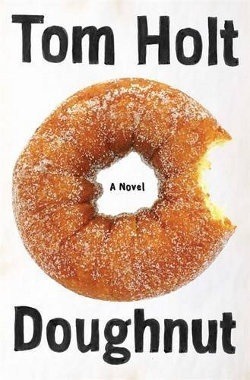 Parker/Holt has a knack for highlighting the absurdity of life, and he does so here with Doughnut, as well. He also brings his unique wit to the book, dipping it in wry before putting it on the page. His similes and metaphors alone are enough to crack me up, and Doughnut is full of them. The story, though, isn't that great. Part of it is Theo: He's hard to like, and comes across as more pathetic than sympathetic, and he doesn't seem to have a lot of agency. That's typical for Holt/Parker, but somehow I couldn't muster up enough feeling for Theo to have any real connection to the plot. The plot is also complicated (which, again, is pretty typical for the author), but it's hard to follow what's happening once (view spoiler)[we jump into the multiverse (hide spoiler)]. It's partly my fault for listening to this on audio, because the sudden jumps from place to place were a lot harder to follow in that format. Oh well. It was an easy read, I'll give you that. Dumb puns from beginning to end. Somehow addictive, and hard to stop devouring, yet it was obvious from the beginning it couldn't be very special, just a sort of "well not I've had that"-experience. Like a doughnut. Also very classic man writing, sorry to say. But it was okay. I have changed my mind about this book. It's actually really cool but a bit confusing. It's really quite funny too but some parts are a bit boring. But I like it, everyone should read this book. Physicist Theo Bernstein didn’t check his math and accidentally blew up the Very, Very Large Hadron Collider, along with an entire mountain and his career too. He lost his wife, his money, even one of his hands is no longer visible after the accident, so he doesn’t have much going for him now that he’s no longer employable. When he receives a letter stating that his old Professer Pieter van Goyen has passed away and left him the contents of a safety deposit box, Theo heads off to Switzerland to Physicist Theo Bernstein didn’t check his math and accidentally blew up the Very, Very Large Hadron Collider, along with an entire mountain and his career too. He lost his wife, his money, even one of his hands is no longer visible after the accident, so he doesn’t have much going for him now that he’s no longer employable. When he receives a letter stating that his old Professer Pieter van Goyen has passed away and left him the contents of a safety deposit box, Theo heads off to Switzerland to see what the strange old guy has left him. The box contains an empty bottle, an apple, a make up compact, and a letter telling him that he can find work at a hotel in the village. Doughnut is a pretty off the wall novel by Tom Holt, and that's not to say that Tommy hasn't written previous off the wall type books. He has. I've read two only. While they were interesting and funny at times, something about them still didn't stick with me. Clearly tagging this one as "gave up on" on my GR shelf, I now wonder why we (people) sometimes feel as though we need to finish books that are less than good, after starting to read them. It must be an accomplishment t I'll make this quick. Doughnut is a pretty off the wall novel by Tom Holt, and that's not to say that Tommy hasn't written previous off the wall type books. He has. I've read two only. While they were interesting and funny at times, something about them still didn't stick with me. Clearly tagging this one as "gave up on" on my GR shelf, I now wonder why we (people) sometimes feel as though we need to finish books that are less than good, after starting to read them. It must be an accomplishment thing, has to be. Anyway, that wasn't my point. This story was "kind of" interesting at times, but it dragged on right in the middle of it. I was so tired of hearing characters banter on and on incessantly that I had to put it down, it was going nowhere. I did quickly read someone's summary of the novel, and surprise-surprise, they felt the same. I'm not saying that this novel is bad, it just didn't hold my attention - at all. All in all, Doughnut is one of those fluff novels that you would pick up at an airport if it was the only thing on the shelf you had to choose from. Comic fantasy, horror and science fiction can be tricky sub-genres and I've found in the past that they sometimes fall flat for me. With Doughnut I certainly started off enjoying the story of Theo and his adventures with various eccentric supporting characters, YouSpace and the alternative realities but then found that my interest and enjoyment was starting to tail off about half-way through. By the fifth and final section I really only continued because it was a reading group selection and I wa Comic fantasy, horror and science fiction can be tricky sub-genres and I've found in the past that they sometimes fall flat for me. With Doughnut I certainly started off enjoying the story of Theo and his adventures with various eccentric supporting characters, YouSpace and the alternative realities but then found that my interest and enjoyment was starting to tail off about half-way through. By the fifth and final section I really only continued because it was a reading group selection and I wanted to be able to participate in discussion. As things turned out I didn't make the meeting but I received a report the next day and apparently I wasn't alone in feeling that it was a good premise that had failed in execution. It may also have been a matter of just not being in the right mood for comic SF/F as I've been reading a lot of serious fiction during the last few weeks and this may not really been what I needed as a break from that. So not a terrible book by any means but one that just didn't work for me. This review has been hidden because it contains spoilers. To view it, click here. Renowned physicist leaves contents of his safety deposit box to Theo, which means he can travel to a parallel dimension (or something). Theo ends up in a weird hotel with a cute girl - hotel turns out to be for people to travel to other dimensions. Geeky and fun. I think I need to read this again when I'm in a different headspace. I like it, though. 3.5 stars. Typical Tom Holt book; totally off the wall plot, implausible characters and a confusing ending. And that's why I enjoyed it!! Theo Bernstein is on something of a losing streak. He lost his money, he lost his wife*, he lost his job, and he lost the visibility of one of his arms. Given how high profile the reason for losing his job was - who knew people would miss a mountain? - it's a wonder he is able to find any work at all, first at an abattoir, then at a hotel. The hotel gig might be easier than hauling offal, but it's a weird job, made weirder by the strange bottle Life is like a box of doughnuts. Mmmmmmm, doughnuts! Theo Bernstein is on something of a losing streak. He lost his money, he lost his wife*, he lost his job, and he lost the visibility of one of his arms. Given how high profile the reason for losing his job was - who knew people would miss a mountain? - it's a wonder he is able to find any work at all, first at an abattoir, then at a hotel. The hotel gig might be easier than hauling offal, but it's a weird job, made weirder by the strange bottle left to him by his old professor, Pieter van Goyen. How can this bottle be the future of entertainment? And is there a doughnut shop nearby? In the middle of last year, an author friend - Kaaron Warren** - recommended The Management Style of Supreme Beings to me. It was one of the nominees for an international award she was judging and she spoke glowingly of it. I'd previously enjoyed one of Tom's books under his KJ Parker pseudonym, so I decided to track it down at the library. Obviously, I was unsuccessful, as instead, I ended up with Doughnut. In some ways, this is a product of the very British bumbling protagonist used in this novel. It tends to influence the way the story is told, usually in a way that is deliberately frustrating but with the reward of large doses of humour. Unfortunately, I'm not sure this was quite funny enough for the narrative style. *Lost his wife in the sense that she decided to leave him, not the lost in the 'we were just walking through the Xmas sales and she let go of my hand for a moment and now I can't find her in this crowd' kind of way. Holt's works include mythopoeic novels which parody or take as their theme various aspects of mythology, history or literature and develop them in new and often humorous ways. He has also pro Tom Holt (Thomas Charles Louis Holt) is a British novelist.